PARIS, France, May 26, 2016 (ENS) – Climate change is quickly becoming one of the most challenging risks for World Heritage sites and the tourists who want to visit them, finds the report “World Heritage and Tourism in a Changing Climate,” released today by UNESCO, the United Nations Environment Programme, UNEP, and the Union of Concerned Scientists. “Globally, we need to understand, monitor and address climate change threats to World Heritage sites better,” said Mechtild Rössler, director of UNESCO’s World Heritage Centre. “As the report’s findings underscore, achieving the Paris Agreement’s goal of limiting global temperature rise to a level well below 2 degrees Celsius is vitally important to protecting our World Heritage for current and future generation,” Rössler said. The new report examines 31 natural and cultural World Heritage sites in 29 countries that are vulnerable to increasing temperatures, melting glaciers, rising seas, intensifying weather events, worsening droughts and longer wildfire seasons. It documents climate impacts at iconic tourism sites, including Venice, Stonehenge and the Galapagos Islands and other World Heritage sites such as South Africa’s Cape Floral Kingdom; the port city of Cartagena, Colombia; and Shiretoko National Park in Japan. “Climate change is affecting World Heritage sites across the globe,” said Adam Markham, lead author of the report and deputy director of the Climate and Energy Program at the Union of Concerned Scientists. In addition, the warming of Greenland’s soils is releasing stored carbon into the atmosphere and contributing to climate feedback mechanisms that are threatening sites throughout the Arctic. Because World Heritage sites must have “Outstanding Universal Value,” the report recommends that the World Heritage Committee consider the risk of prospective sites becoming degraded by climate change before adding them to the List of World Heritage. The tourism sector itself is vulnerable to climate change. Threats include more extreme weather events, increasing insurance costs and safety concerns, water shortages, and loss and damage to assets and attractions at destinations, the report points out. Continued climate-driven degradation and disruption to cultural and natural heritage at World Heritage sites will negatively affect the tourism sector, reduce the attractiveness of destinations and lessen economic opportunities for local communities. But tourism also can play a positive role in helping to secure the future of many World Heritage sites in a changing climate, the report points out. The report’s goal is to provide up-to-date information and a basis for action on climate change, tourism and World Heritage in the follow-up to adoption of the Paris Agreement by the Conference of the Parties to the United Nations Framework Convention on Climate Change (UNFCCC) in December 2015 and the 2030 Agenda for Sustainable Development, adopted by the United Nations General Assembly in October 2015. The study recites a litany of climate changes that are affecting World Heritage sites. Global temperatures have increased by 1ºC since pre-industrial times (NASA 2016), and since the 1950s some of the changes, including the warming of oceans and the atmosphere, rising sea levels and diminished snow and ice cover, are unprecedented over decades to millennia (IPCC 2014). The Intergovernmental Panel on Climate Change (IPCC), in its 2014 report, projected that global surface temperatures will rise through the 21st century under all assessed emission scenarios. Heat waves are very likely to occur more often and last longer; extreme precipitation events will become more frequent and intense in many regions; the oceans will continue to warm and acidify; and the rate of sea-level rise will increase, the IPCC warned. The 30-year period from 1983 to 2012 was probably the warmest in the northern hemisphere for 1,400 years, while there has been a 26 percent increase in ocean surface water acidity since the beginning of the industrial era, the IPCC reported. Two of the case studies – the Statue of Liberty in the United States and Venice and its Lagoon, Italy – demonstrate the scale of financial resources that will be required for increasing the resilience of many World Heritage sites in a changing climate. To date, US$ 100 million has been allocated to the Statue of Liberty and adjacent Ellis Island for the restoration of utilities, services and visitor facilities damaged by Hurricane Sandy in 2012, and to ensure preparedness for the storms that are predicted to continue to increase in intensity in future, with more damaging storm surges resulting from sea-level rise. In Venice, work is almost completed on a project to build gates to prevent flooding, costing more than US$6 billion. Yet, the amount available to States Parties requiring international assistance to support site management through the World Heritage Fund totals just US$4 million – a small fraction of what is needed given the scale of response required. Wildlife will suffer too, particularly the few hundred remaining mountain gorillas in the wild. Just under half of the world’s remaining endangered 880 mountain gorillas, Gorilla beringei beringei, live in southwestern Uganda’s Bwindi Impenetrable Forest National Park. Gorillas are iconic and their populations here and in their other stronghold in the Virunga Mountains on the borders of Uganda, Rwanda and the Democratic Republic of Congo, have been increasing in recent decades as a result of effective forest management and protection strategies. 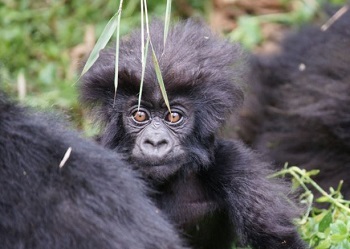 These efforts have been helped by revenue from gorilla tourism in both Rwanda and Uganda. activity in the country’s tourism sector. Estimates put the value of gorilla tourism to Uganda alone at US$20–46 million annually, with the potential to generate US$151 million each year. But the gorillas and the economic benefit they represent are likely to come under threat from climate change. A changing climate is expected to increase stress and threats to gorillas due to alterations in habitat conditions and perhaps greater vulnerability of the animals to human diseases. Farther south on the African continent, South Africa’s Cape Floral Kingdom is one of the world’s most extraordinary regions for plant biodiversity. A huge magnet for nature tourism, the World Heritage site consists of more than 1 million hectares of protected areas including the Table Mountain and Garden Route National Parks, surrounded by nearly 800 000 hectares of buffer zones. Kirstenbosch National Botanical Garden with its 7 000 garden and wild plant species is also within the World Heritage site. The region’s predominant vegetation is the unique fynbos (fine bush), one of only six floral kingdoms in the world, characterized by fine leaved vegetation adapted to a Mediterranean type climate with periodic fires. 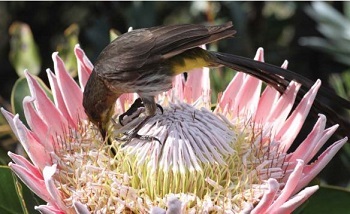 The region is famous for its plant diversity, including the Proteaceae family that features South Africa’s national flower, the king protea, Protea cynaroides. Climate change has already been recorded in the Western Cape region, with studies suggesting an average warming of 0.1–0.2ºC per decade from 1901 to 2006 in the Greater Cape Floristic Region, with rates in the later decades being higher than earlier in the century. Climate models suggest that by 2070 the fynbos will experience average temperatures over ten months of the year that would have been considered extreme in 1961–1990. There is also evidence that the incidence of very large fires has increased since the 1990s, and the total average area burned annually has expanded since the 1980s.